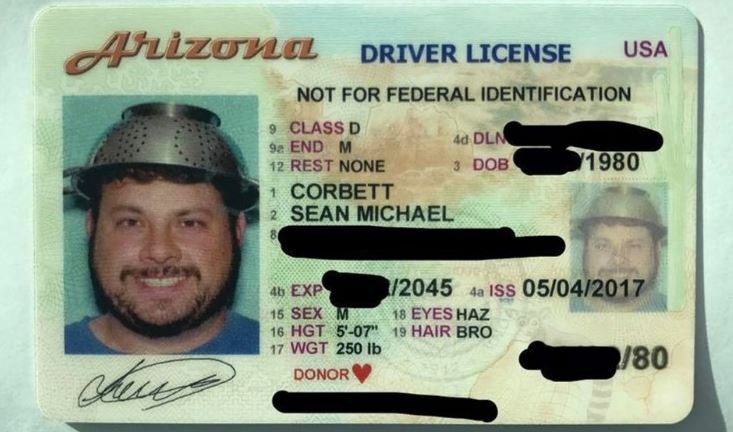 Congratulations to Mr. Corbett — Arizona finally allowed him to wear a colander in his ID photo, after many attempts. “I tried a couple different locations and was met with a lot of pushback and resistance,” he said. “I was scorned at every location I went to, and they put out a memo about me, so by the time I got to (the) fourth and fifth MVD, they stopped me at the door. He recently tried again and, after talking with the location’s manager, was able to take the photo. He received his official ID in the mail Tuesday. A spokesman for the Arizona Department of Transportation, which oversees the Motor Vehicle Division, released a statement on the matter. “MVD license and ID photos are meant to show a person’s typical daily appearance and allow for religious expression or medical needs. Photos are filtered through facial recognition technology and if an error occurs, the photo can be recalled,” the statement said. Whatever the outcome, it’s nice to see people like Mr. Corbett fighting for their rights. The struggle itself is so important. Our view is that it’s inappropriate for a government organization to make a judgment based on a person’s religion. If the head covering meets the visibility requirements, it should be allowed no matter what religion that hat is associated with. Sometimes the DMV workers don’t know the rules fully, and that is understandable. Perhaps some of the workers are letting their personal views color their behavior, which is unfortunate but human. What is more interesting is in cases like Mr. Corbett’s, where management gets involved — the actions they take will be very important to watch. For now let’s give the Arizona officials the benefit of the doubt and hope that Mr. Corbett will be afforded the same rights as members of other religions. Again, congratulations on the win, Mr. Corbett, and thank you for your effort. And thank you to Pastafarians everywhere, who are fighting for their rights. There’s a nice article about this at USA Today here. Way to go! keep up the fight! I have no doubt that The FSM enjoys occasional similar weekends. Who cares? Good luck with your marriage settlement. I would Cary my colander with me. Every day appearance. I have known for decades that the Arizona DMV has no sense of humor (quick flash on Tommy Lee Jones in MIB: “No Ma’am; we at the FBI do not have a sense of humor of which we are aware!”) Back in the the 80s a friend had his vanity license plate repossessed when the newly appointed director of the agency read it one day and realized that “4Q” might be interpreted in novel ways.